Lemongrass Spa Body Polish: It's Scrubalicious! There's a new body scrub in town and it is F-A-B-U-L-O-U-S. I love a good body scrub -- salt, sugar, coffee -- you name it and I will slough off dry skin with it. My cousin, Ashley, is a registered nurse and mom to twin toddlers. Not long ago, she signed up to become an independent consultant for a natural products company called Lemongrass Spa. The products are gluten-free and paraben-free and are handmade in Colorado. Everyone needs some exfoliation. Even in the summer time when it's generally not as dry as it is now in the middle of winter, a good scrub can make your arms and legs smooth and radiant. It also provides the perfect canvas for applying tinted bronzers and self tanners. Why? At some point, most of us will notice a decrease in skin radiance. It doesn’t have to be that way, though. If you make exfoliation a regular part of your skin care routine, you’ll get your glow back. Cell turnover slows down as we age, so it’s important to help the process along so our skin can shed dead cells. Using a gentle scrub like Lemongrass Spa Body Polish will slough off that top layer of skin, over time your skin will look fresh and healthy once again. Choosing the right scrub is key. Finding the perfect balance between the scrubbing agent (whether it be nutshells, sugar salt, etc.) and the oils can be difficult. Too much oil, and your tub is left a slippery, greasy mess. Not enough oil and your scrub is too dry and won't leave your skin feeling nourished. 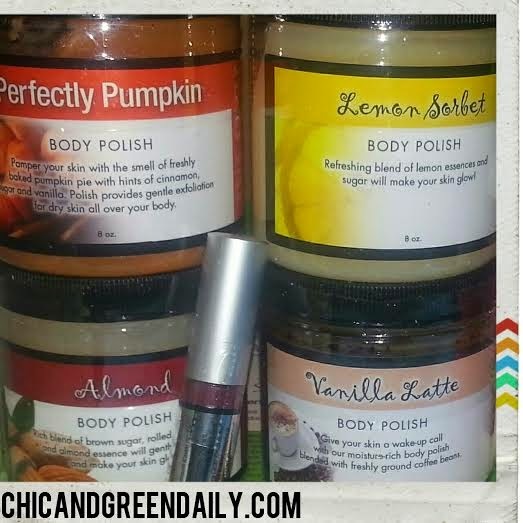 Thankfully, there are some really lovely body scrubs available now! I recently hosted an online party for Lemongrass Spa. It was SO much fun -- like my nail parties -- expect in this case, I was the hostess and Ashley was the consultant. It was easy peasy and I earned all sorts of amazing free rewards! Just for hosting an online party, I earned all of these scrubs, plus a concealer brush and lip gloss. More on those in another post. The Lemongrass Spa Body Polish truly rocks my world. I chose the Vanilla Latte, Perfectly Pumpkin, Lemon Sorbet and Almond. The ingredients are truly natural and beneficial to the skin. Each scrub varies slightly depending on the one you choose. The Vanilla Latte, for example, contains coconut oil, grapeseed oil, vitamin E, coffee grounds and more. The Almond features sweet almond oil, mango butter, honey and gluten-free whole grain oatmeal. Each formula contains something truly special to treat the skin. They smell amazing -- and contain only phthalate free fragrances. When you purchase 3, they are $2 off. I highly recommend these products and Lemongrass Spa!